EPIC news for all country pop lovers out there!! Keith Urban is on tour in 2018 with “GraffitiU,” his yet-to-be-released 9th album!! 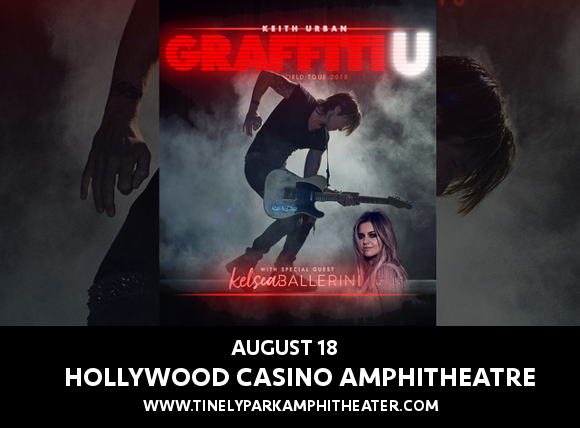 On Saturday 18th August 2018, Keith Urban, together with super support from Kelsea Ballerini, is on his way to the Hollywood Casino Ampitheatre to give fans the show of a lifetime!! Don’t wait about – get tickets today, before they disappear! With an illustrious career spanning nine studio albums, 37 singles in the charts and multiple awards including Grammys, Keith Urban’s new album promises to be something to truly look forward to. The New Zealand-born country star has said that he’s been writing more for this album than he ever has before, even for his most recent releases “Fuse,” and “Ripcord”. He’s got so many songs ready that he doesn’t even know yet which tracks will make it onto the latest album, not even his latest single “Female”. We’re dying to hear it too – even more so live!! What are you waiting for?? Grab your tickets NOW while you still can!